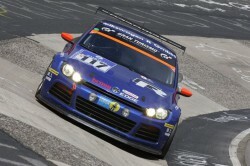 Volkswagen Motorsport entered biomethane-powered 330 hp GT24 Sciroccos into the Nurburgring Nordschleife 24-hour event again this year and came up triumphant, just as it did in 2010, in the alternative fuel class and well as performing well in overall placings. Compared with conventional spark ignition engines the use of biomethane allows CO2 emissions to be reduced by 80 per cent. The drivers of car #117 (Nasser Al-Attiyah, Carlos Sainz, Giniel de Villiers) finished first in the alt-fuel category and 27th overall in a field of more than 200 starters, while car #116 (Vanina Ickx, Wyss, Bernd Ostmann) finished second and 46th respectively. Nasser Al-Attiyah, Carlos Sainz, Giniel de Villiers, Dakar rally winners in 2009, 2010 and 2011 using Volkswagen vehicles, drove as a team for the first time. The fourth driver for both teams was DTM racer Klaus Niedswiedz. Six alternative-fuelled vehicles entered the race this year, two more than last year. VW Motorsport also entered three 450 hp Golf24 cars in the event, employing reconfigured Audi TT RS engines, but all were forced to retire from the race early on. This item primarily compiled using information from a VW Motorsport press release.